The cannabis industry attained new highs in 2016, paving the way for some big changes this year, says Tom Beck, senior editor of Portfolio Wealth Global. Four states in the U.S. voted in favor of legalization on November 8th of 2016, and it was expected that the cannabis market would rake in over $6.7 billion from the U.S. alone in 2016. For starters, sales of cannabis are set to rise to $22.8 billion in the U.S. by 2020. The graph above captures the rollicking growth rate of the market. Portfolio Wealth Global sees this as a dam bursting, but the magnitude of the moment is understated—that’s because even top hedge fund managers still don’t have a handle on whom the top dogs are, and that’s exactly the opportunity we see in building strong relationships with the “Green Rush” entrepreneurs, becoming Cannabis Innovators and we are right now watching closely one company. Donald Trump became the 45th President of the United States, and it’s still not clear how the U.S. market will shape up for the remainder of 2017, but based on what Trump has said pertaining to his pro-business beliefs and agenda, America is about to surge forward. The ramifications of his victory are still unclear in a few respects, but when it comes to jobs, and this has already been shown by some companies already stating that they are going to remain in America (Ford and Carrier), we’re about to see serious job growth. 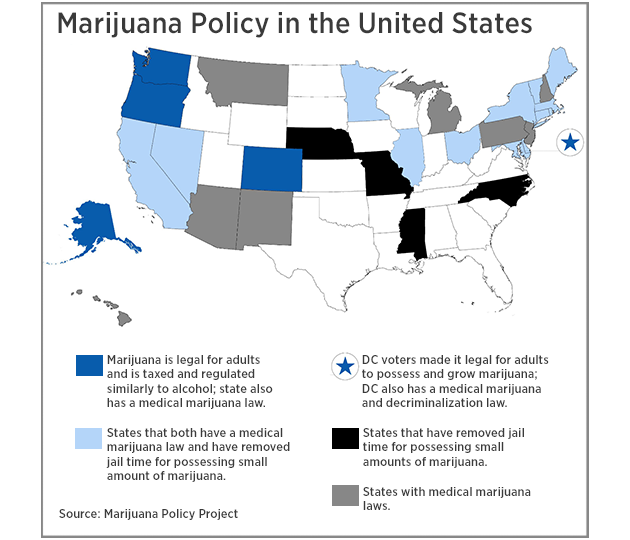 In regards to marijuana, no specific federal policy governs the enforcement of the U.S. Controlled Substance Act. This bodes well for the medical cannabis market. Cannabis investing is part of what Portfolio Wealth Global considers the top three industries to own for serious gains, along with cutting-edge technologies and natural resources. However, going against the cannabis industry right now is akin to political suicide. In fact, the victories secured in favor of legalization on Election Day simply confirm that the cannabis industry has a stronger backing than ever. In fact, a study conducted by Pew Research in the U.S. found that the percentage of adults in favor of marijuana legalization is an astounding 57%. That is almost equal to how many people admit the ACA is not working. Moreover, various Republican states, such as Pennsylvania, Florida, and Ohio, were all supportive of the legalization of cannabis in 2016. It seems unlikely that President Trump would be willing to spend a large amount of political capital going against such a popular trend. Trump knows there are bigger fish to fry, and legalizing marijuana is long overdue anyways. Here’s a heat map of how the marijuana legalization policy looks like across the nation. This indicates that, at least on the economic and political front, the new presidency will not do anything to back down on the present policy of the government or increase enforcement. Rather, the status quo is all but guaranteed to continue, signifying the unabated rise of the cannabis industry. America needs all the jobs it can get, after eight years of an anti-business White House dictating policy. Pioneer investors realize that returns on cannabis stocks are volatile in nature. In 2016, the Marijuana Index was up by over 180%. The stock performance in the cannabis industry is “correlated,” meaning individual company stocks regularly rise and fall in tune with the larger industry as a whole. We are conducting due diligence on the top 57 marijuana stocks that are run by brilliant business-oriented individuals and will publish our top picks in the 1st quarter of 2017. The market for cannabis in the United States is going to be governed by the federal policy for CSA enforcement. Barring any kind of draconian response on the part of the government, the current momentum that is being generated by the new states will go a long way in taking the marijuana industry to new heights and influencing their share prices. Any way you look at it, potentially exciting times lie ahead for the cannabis industry. True contrarians will benefit from their foresight and financial discipline as the next chapters of this growth story unfurl. This Sunday, after I spent weeks dissecting this industry, we will profile the cannabis company to members of our FREE newsletter that has cleared all the parameters we looked at. After our debut technology stock soared over 60% in four months, this company could be our 1st100% gainer. Tom Beck is senior editor of Portfolio Wealth Global. Known as one of the first millennial millionaires in the United States, Beck is a relentless idea machine. After retiring two years ago at age 33, he’s officially come out of retirement to head up Portfolio Wealth Global. He brings a vision of setting a new record for millionaires with his seven-year plan to accelerate any subscribers’ net worth who will commit to the income lifestyle. Beck delivers new ideas on the marketplace that were once only available to the rich. Traveling the world, he’s invested in over a dozen countries, including real estate. All charts provided by author.